I might as well have ED set up a direct withdrawal from my bank account. The pace of my purchasing modules from them has sped up considerably the last year and I anticipate it getting out of control now. Example: I set up a mission where I will be using an NDB (307 kHz) on the way out and an NDB (662 kHz) on the way back. I set them into the ME under NEAR and FAR respectively. After start up, I turn my NDB radio to COMP. As I switch between NEAR and FAR, the needle jumps between the two (both are in range). However if I retune the NEAR manually, then that NDB is the NEAR wen I switch to COMP. Correct? And that’s how I want to use it. But I find it too hard to tune a new station while flying. I really need to center my stick. The purpose of the near and far switch is bad weather or night landing. You set up the double needle on the approach heading. Then you set up the outer beacon to far and inner beacon to near. As you make your approach, you van toggle between the two to ensure your alignment with the runway. This MiG is neat. The module is far from perfect but it really is a gem in the rough. It’s inspired me to learn navigation more than any other module. You really can’t fly this without a flight plan. The station tuning is evidently broken. The key binding doesn’t work yet. If it did, there would be no problem tuning and flying (OK, a little bit, but normal for an aircraft of that time). Hopefully it is an relatively easy fix and is included the next update. Are the fuel tank switches working? I forgot to turn one on and everything still worked. Thought all had to be on to get fuel from each tank. 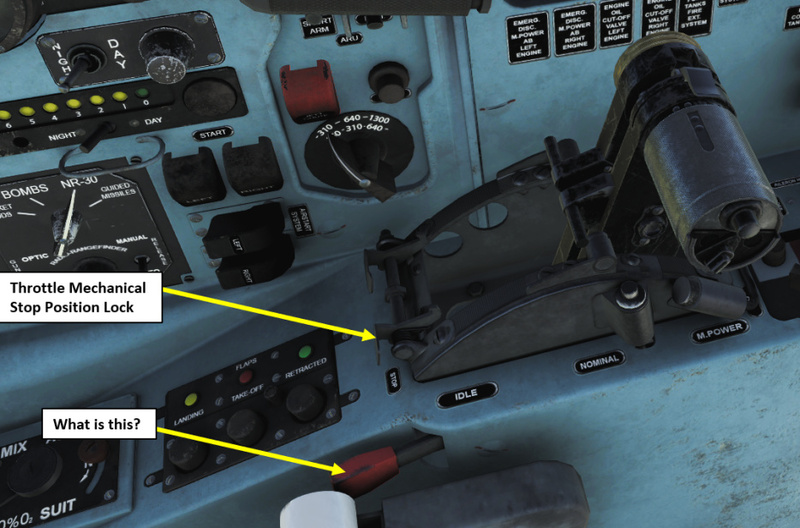 The manual (pg 25) says to press the needle sync for the GIK-1 Compass for 2-3 before engine start and that it will fully align after 2-3 minutes…I don’t see any change. The “alignment” button for the artificial horizon seems to work…b-ut it also seems to work just as well if it is not pressed. Do you have to set the clock every start up? Isn’t there something in the special settings about this? I really like fling this jet. There is just something about it. It is a beast. That sounds correct to me. During the day you have sunlight streaming in and glare and probably have your visor down, so it needs to be bright. At night, visor up, low ambient light, a bright screen is going to blind you or at least wash out other instruments and ruin your night vision, so it needs to be dim. Your car dashboard works the same way. If you have a newer car with an LCD screen, that is. The first Cold War MiGs are basically extensions of their piston fighter predecessors. 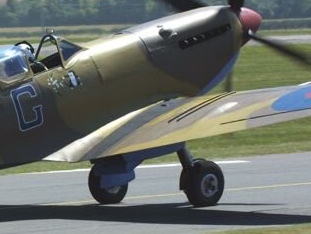 You use them in combat in some similar manners as you would use a WWII dogfighter, granted at much higher speeds. It’s just a great formula. The Eurofighter did exactly the same. The “night mode” switch cut off light by/around 50%. There is a lengthy post about its flight model tweaks as well. Looks like the days of not stalling or spinning are gone. 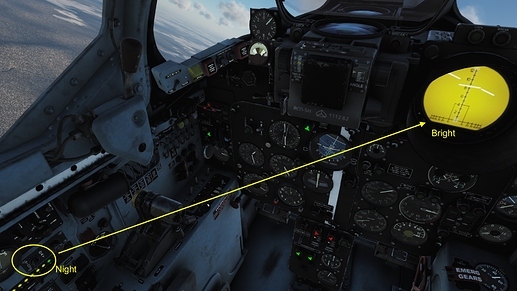 Looks Like RAZBAM changes didn’t make it into this DCS World beta update. D’awww. Version control is a female dog, especially on a project as complex as DCS, with so many parties contributing. @NineLine’s list was for 2.5.…41. Yesterday’s update was 2.5.…40. A couple of issues I’ve noticed…the Day/Night radar switch is indeed backwards with the Night setting very bright and Day setting very dark. However, there is a very easy fix for this. 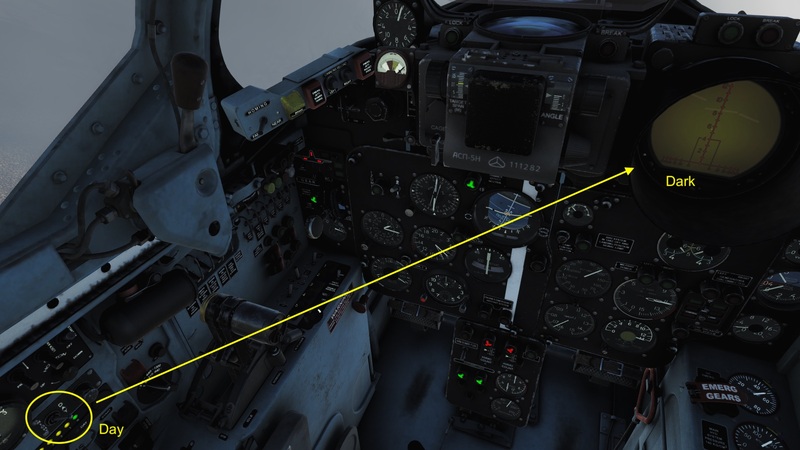 If yo set te cockpit language to Default, the Day-Night markings are changed to Russian…and since I don’t read Russian, it looks just fine to me. One issue that I’m pretty sure is a bug…with a target locked, if you start to mess around with turning the radar on & off and/or switching the gunsight between optical and radar, sometimes the radar lock light will just stay on…eve with the radar off and even after you go back into ME and restart the mission. Not sure if this happens with flying the mission directly from Missions. Has anybody else noticed this? 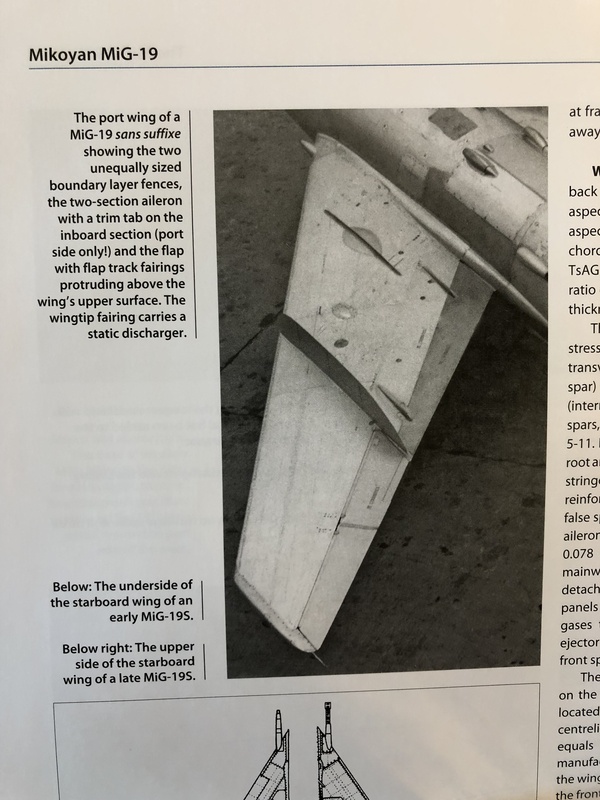 Question for you guys… what’s that small metallic kink on the MiG-19’s wing between the wing root and the fence? Another question: what is that red lever next to the throttle quadrant? No idea on both. I found the signal flare launcher if that is any help. I’m just guessing, but it looks like it’s along the wheel well bulge. If that’s the case, it’s most likely a reinforcment, since the structure has been opened up to accomodate the gear. I believe this is what you are looking for? One of the boundary layer fences? The strake reminds me of the skin reinforcements of the Spitfire. Above the wheel well, the wing skin is reinforced.